Paperback, 9.5 x 11.5 in. / 368 pgs / 321 color. 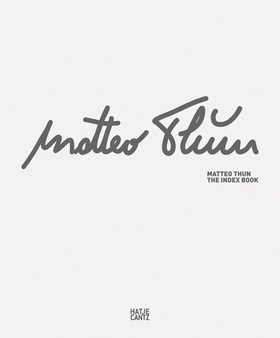 As a co-founder of the design group Memphis (with Ettore Sottsass, Andrea Branzi, Aldo Cibic, Michele de Lucchi, and Michael Graves), Italian designer and architect Matteo Thun (born 1952) has been responsible for some of the most instantly identifiable product styles of recent times. The Memphis group’s colorful postmodern furniture, with its wacky amalgam of kitsch and futurism, helped define product design of the early to mid-1980s; in the early 90s, Thun took his upbeat aesthetic to Swatch, where he was Creative Director until 1993. Campari, Illy coffee, Philips electronics and Porsche are just a few of the brands Thun has enlivened with his inimitable touch, and in his architectural work, his Side Hotel in Hamburg was chosen as Hotel of the Year in 2001, and in 2004 his Vigilius mountain resort won the Wallpaper Design Award. Matteo Thun: The Index Book takes a thorough inventory of his career, from 1980 to the present, in an A to Z format. It looks at all aspects of his output, from architecture to product design--from coffee cups to restaurants, from mountain resorts to wristwatches, from saucepans to villas. Reproducing plans, watercolor drawings, photographs and sketches, the book approaches Thun’s work through themes such as sustainability and environment, economy and aesthetics, energy saving and contemporary luxury. As a cofounder of the design group Memphis, Italian architect and designer Matteo Thun has been responsible for some of the most instantly identifiable product styles of recent times. This book is an inventory of Thun's career from 1980 to the present, in an A to Z format. FORMAT: Pbk, 9.5 x 11.5 in. / 368 pgs / 321 color.